White Oak, SC… Contemporary worship programs place more demands than ever on today’s sound reinforcement systems. For a church’s ministries to reach out and connect with all age groups in order to make the worship experience meaningful, the necessity of having the right sound reinforcement system is critical. A high degree of speech intelligibility is not the only measure of a viable sound system. Nowadays, that system must also provide natural sounding support for a wide variety of music—from choral groups and handbell choirs to the electronically influenced praise band. This is no small requirement, as each type of ensemble places its own unique demands on the sound system. All the while, of course, that system is expected to deliver clear, natural sound to all areas of the sanctuary. 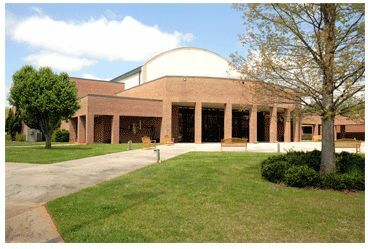 The challenge of providing a sound system capable of addressing a broad range of activities was particularly acute at the White Oak Conference Center, the meeting facility for the South Carolina Baptist Convention of Columbia, SC. Set in the wooded hills of the midlands, the White Oak Conference Center provides modern day comforts in tranquil surroundings away from daily routines and distractions. It is the ideal venue for a wide range of activities and, as such, is rented by Southern Baptist churches throughout the region for a multitude of special events, including meetings, workshops, music and theatrical programs, as well as youth camps during the summer months. And let’s not lose sight of the fact that this same facility is used for indoor sports—including basketball. The White Oak Conference Center features a specially carpeted floor surface that is permanent, which interestingly, is suitable for bouncing balls while also providing sound absorption to help minimize acoustic reflections. For basketball games, the field goals are removable. Similarly, seating throughout the facility is portable in nature, with a capacity of 1,000 – 1,200 people—depending upon the nature of the event. A large, permanent stage area with a proscenium arch resides along one side of the court’s length, while the FOH (front of house) mix position is located in an elevated “loft” along the opposing wall. The stage area measures approximately 50 feet wide by 30 feet deep. The facility’s ceiling height measures roughly 35 feet. 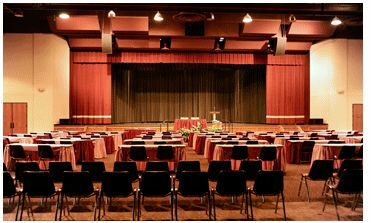 Lexington, SC-based Gattis Professional Audio, a full service audiovisual, lighting, and staging company that handles design/build projects for the contractor market and also has a special events division, was contracted to handle the White Oak Conference Center’s sound system upgrade. Sid Gattis, President of Gattis Professional Audio, discussed the challenges of the project. 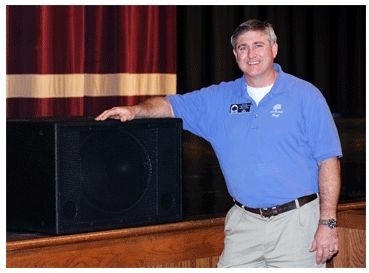 After careful consideration, Gattis specified a loudspeaker system consisting of two TrueLine X5i-P powered line arrays coupled with a pair of TrueLine TL215S subwoofers—both manufactured by Greensboro, NC-based WorxAudio Technologies. The X5i-P is a two-way, high efficiency, ultra compact line array incorporating five modules in a single enclosure. It utilizes a total of five 1-inch exit compression high frequency drivers and ten 8-inch cone transducers for low frequency reproduction and is powered by the company’s PMD-3 digital power amplifier, which provides 2,000 watts of power for the low frequencies and 500 watts for the highs along with twin digital program processors. The TL215S is a compact, high output subwoofer featuring dual 15-inch high excursion transducers. The subwoofers are powered by a single Yamaha PC9501N networkable power amplifier. For those organizations that do not have a person proficient at mixing audio, Gattis specified a Yamaha DME24N Digital Mixing Engine. In addition to serving as an 8-channel automated mixing system, the DME24N has extensive audio processing capabilities and also functions as the loudspeaker management system. With provisions for expansion, the DME24N that Gattis installed is augmented by the addition of a Yamaha MY16-AT Digital I/O expansion card as well as a Presonus DigiMax D8 8-channel microphone preamp. The Yamaha DME24N is housed in an equipment rack behind the stage’s rear wall. For those organizations conducting musical and theatrical events and have someone to mix the programs, the White Oak Conference Center also has a unique FOH setup. Equipped with a Yamaha MG32/14FX 32-channel analog mixer, the FOH mix position can be re-located from its usual spot in an upper area loft along the opposing wall from the stage to the main floor. 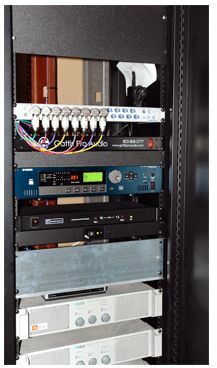 The White Oak Conference Center audio system upgrade occurred during February 2009 and was placed into service immediately upon completion. Gattis reports that everyone involved with the project is extremely pleased with the new sound system’s performance and this sentiment was echoed by John Cathcart, the White Oak Conference Center’s Director of Technical Operations.